Raising a kitten is one of the most fun things you’ll ever do, but it’s also a big responsibility. The following guide will walk you through the basics of how to take care of that playful, purring bundle of fur. Kittens are so cute, it’s understandable that cat owners sometimes wish their kittens could stay kittens forever. This is the when you, as the pet parent, lay the foundation for your cat’s future health and behavior. Not to mention, it’s the stage where you have to decide what food to buy, what vet to visit, and where to place the litterbox. Fortunately, all of your hard work during these first few months is compensated by loads of snuggling and adorability. Though it’s not something you have any control over, your kitten’s age is more than just a number. In fact, it’s crucial that you learn it. Kittens have very specific developmental needs for the first 10 weeks of their lives in terms of nourishment, warmth, socialization, and excretion. For this reason, most breeders and shelters typically wait until their kittens are of age before they’re put up for adoption. If you, by chance, find yourself in a situation where you need to care for an orphaned kitten under 10 weeks old, consult your vet for special instructions. If you don’t have a vet in mind already, ask friends for recommendations. If you got your cat from a shelter, ask their advice as they may have veterinarians they swear by. Local dog walkers and groomers are also a great resource for pet recommendations. One of the first things you should do with your new cat, if not the very first, is take him in for an exam. This trip is almost as important for the owner as it is the kitten, because it not only tests for health issues like birth defects, parasites, and feline leukemia, but it allows you to ask those all important questions including advice on litterbox training your kitten. Discuss kitten-safe options for controlling parasites, both external and internal. To keep up with your kitten’s appetite, you’ll want to establish a daily feeding routine. The best way to ensure that you’re not under or over-feeding your kitten is to consult with you veterinarian about how much and how often to feed. At 3 to 6 moths of age, most vets recommend feeding your kitten three times a day. Once he’s reached six months, you can scale it back to twice a day. Keep stocking your pantry with kitten food until your baby reaches adulthood, 9 to12 months old. In addition, don’t forget to keep his water bowl fresh and filled at all times. But hold the milk. Contrary to popular belief, milk is not nutritionally sufficient for kittens and can give them diarrhea. Get advice on the best way to litterbox train your kitten. 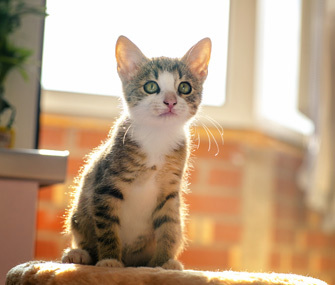 Before you bring your kitten home, it’s best to designate a quiet area where the kitten can feel comfortable and safe. In this base camp, you’ll need to put a few essentials like food and water dishes, a litterbox (preferably one with low sides), and some comfortable bedding. Tip: Remember, cats don’t like their food and litterbox too close together. So place the food dishes as far away from the litter as possible within the space.